Like to play in the water? 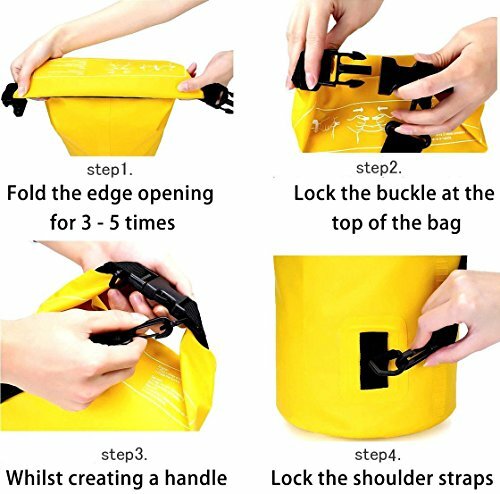 Hurry and get the 10L Dry Bag – Wolfyok Waterproof Roll Top Duffel Bag with Adjustable Shoulder Strap. It Keeps Gear Dry for Kayaking, Boating, Swimming, Rafting, Hiking, Camping, Fishing and Snowboarding today for only $7.99 from Amazon – regularly $15.99! DURABLE AND STRONG: Wolfyok dry bag is strong and durable, comfortable to carry, suitable to keep valuables dry in any wet situation. Thick PVC material provides protection from abrasion for screens and glass, the premium quality will not let you down. 1. Roll the top at least 3 times and securely close the buckle to ensure a waterproof seal. 2. Washing in detergent or hot water is NOT suggested. 3. Do not bleach or leave for extended time of direct sunlight. Buy the 10L Dry Bag – Wolfyok Waterproof Roll Top Duffel Bag with Adjustable Shoulder Strap Keeps Gear Dry for Kayaking, Boating, Swimming, Rafting, Hiking, Camping, Fishing and Snowboarding from Amazon. Previous articleRecipes With Pretzels! 22 Pretzel Recipes To Dress Up Store Bought Pretzels! Next articleFold N Fly Paper Airplanes Kit – Stock Up Alert!